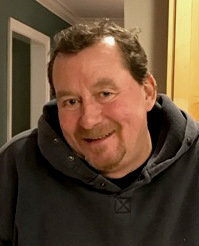 Obituary for Robert William Malmberg | Doolittle Funeral Service, Inc.
Robert William Malmberg, 56, of Durham, passed away unexpectedly on Sunday, March 31, 2019 at Hartford Hospital after suffering a heart attack. Born in Middletown, he was the son of Mary Ann (Calcagni) Malmberg of Portland and the late Herbert N. Malmberg. Bob lived in Durham all of his life but Vermont was his second home. His passion was the outdoors. He loved his dogs and hiking, but many would consider Bob the greatest fisherman ever. Along with his Mother, Bob is survived by his brother, Richard Malmberg and his wife, Cindy of Durham; his sister, Lee Ann Palladino and her husband, Michael of Old Saybrook; his nieces and nephews, Erica, Matt, Debbie, Michael, Britany, and Brent and his beloved dogs, Bull and Tanner. Services will be private and at the convenience of the family. In lieu of flowers, donations in Robert’s memory may be made to the Connecticut Humane Society, 701 Russell Road, Newington, CT 06111. To share memories or send condolences to the family, please visit www.doolittlefuneralservice.com.